One of the biggest decisions motorists need to make when shopping for a new car is whether to buy or lease. Volvo is throwing a third option into the ring, one it describes as a subscription model. The 2019 XC40, the brand’s newest and smallest SUV, will inaugurate the Care by Volvo program early next year. “This is not a value plan where you get the drink and fries on the side and it’s cheaper that way. We’re not looking to replace a lease or a cash sale. We want to create a different option for people,” Dean Shaw, Volvo’s vice president of corporate communications, explained during a presentation. In some ways, Care by Volvo is like the Netflix of the automotive world. In some ways, Care by Volvo is like the Netflixof the automotive world. It’s a pioneering subscription service that aims to take most of the hassle out of the new car-buying experience. Instead of haggling endlessly, motorists pay a fixed, pre-determined monthly fee. It includes a brand-new car, an insurance plan through Liberty Mutual, a concierge service, roadside assistance, and maintenance; Volvo covers anything from an oil change to brake pad replacement to new windshield wipers. That’s on top of the factory warranty, of course. The contract lasts two years, though Volvo gives subscribers the option to upgrade to a new car any time after the first year. They can buy their XC40 at the end of the two-year period, start over with another XC40 for two more years, or simply return it and opt out of the program, no strings attached. It sounds a lot like leasing but it’s not; the significant difference is that the customer owns the car during those two years. “This isn’t something we just made up. It came straight from the group CEO,” Shaw noted. Care by Volvo draws inspiration from popular services like Netflix, Spotify, and Amazon Prime. Getting an XC40 through Care by Volvo is almost like selecting a new cell phone, and that’s not a coincidence. Getting an XC40 through Care by Volvo is almost like selecting a new cell phone, and that’s not a coincidence. It’s easy, it’s straight-forward, and motorists know if they don’t like what they get they’re not stuck with it for life. 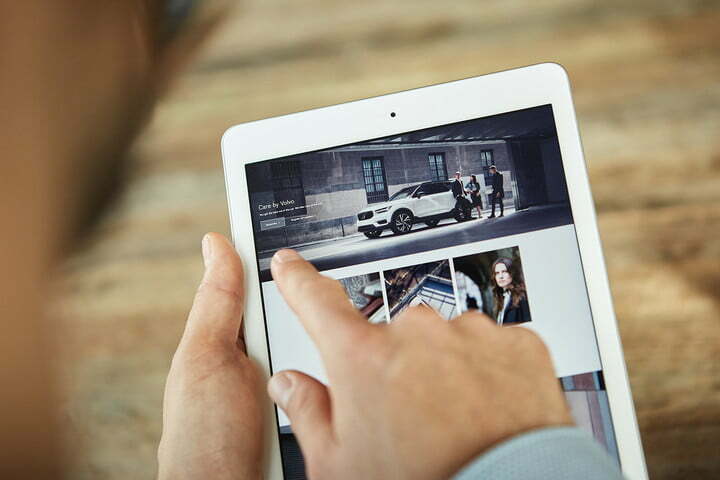 Volvo expects providing easy entry and exit points to a one-size-fits-all model will cement the program’s popularity, as will conducting the bulk of the transaction on the web. To begin the process, the firm asks customers to configure their car online, which largely comes down to choosing colors and selecting option packages. They then put down a refundable $500 deposit, choose their preferred Volvo retailer for delivery, and submit an application to ensure they’re eligible for enrollment. Volvo’s finance department and Liberty Mutual will then review the application. They’ll examine the applicant’s credit history and driving record. If everything is in order, a concierge calls the client to coordinate when to deliver the car. XC40s earmarked for Care by Volvo are part of a separate inventory owned directly by the Swedish brand, meaning they don’t come from dealer lots. Volvo stores its cars in Los Angeles and in Newark. Clients who live close to either port can get a car in just a few days’ time. Those in the Midwest – or, say, Alaska – will need to wait up to a week. Alternatively, buyers can choose to participate in Volvo’s Overseas Delivery program. For $600 a month, buyers receive a 2019 XC40 Momentum with the 248-horsepower T5 engine and all-wheel drive. The SUV comes generously equipped with the Premium package, the Vision package, heated front seats, a heated steering wheel, a panoramic roof, and 19-inch alloy wheels. Buyers who can stretch their budget to $700 a month get an R-Design model with all of the aforementioned equipment plus an upgraded Harman Kardon sound system, 20-inch alloy wheels, and the Advanced package. Is it worth it? It depends on where you live, how much you currently pay for insurance, and how much you value convenience. Do the math and there’s a chance Care by Volvo actually costs more per month than leasing and getting insurance on your own. But, if you live in an area – like Detroit – where insurance is inordinately expensive, you might find Care by Volvo is tailor-made for you. If you want to buy a car like you buy an iPhone, odds are you’re already sold. There are limitations, as you’d expect. First, and importantly, participants are limited to 15,000 miles annually. Second, the flat monthly sum doesn’t include registration fees or local taxes applicable to the purchase of a new car. These vary greatly from state to state. There will be an early termination fee, too, though Jim Nichols, Volvo’s technology and product communications manager, told Digital Trends it hasn’t been set yet. The company will finalize the terms and conditions before it begins deliveries in the spring of next year. Volvo offers its Care program in all 50 states and seven European countries. The company tells us that, so far, about 2,000 American customers have shown an interest in signing up for the program, an encouraging statistic which suggests Volvo really is on to something with its subscription model. It’s unique on the market. Porsche Passport and Book by Cadillac are similar in that both require a monthly fee but they focus on giving users flexible access to many models they essentially rent, not own. The final catch is that, right now, the XC40 is the only vehicle available through Care by Volvo. The final catch is that, right now, the XC40 is the only vehicle available through Care by Volvo. The company admits adding more models – including the brand-new XC60and, possibly, used cars – makes a lot of sense. There are no established plans for growth, however. When to expand Care by Volvo, and how big it will ultimately become, will largely depend on its success over the next couple of years. We’re betting Volvo will develop it before the first customers reach the end of their initial two-year contract.